Pleasant studios and suites are fitted with modern furnishings in neutral colours and artwork. Comfortable lounge areas feature a sofa set, flat-screen TV and DVD player. Meal preparation is easy with fully furnished kitchenettes. For office services, guests can approach staff at the well-equipped business centre. A library offers a quiet lounge area. Staff can assist with transport and food delivery services. A range of international dishes is served at Oakwood’s restaurant. Meals can be served in suites. Easily accessible from J. 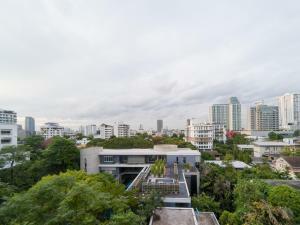 Avenue, Oakwood Residence Sukhumvit Thonglor Bangkok is a 15-minute walk from the BTS Station and Thonglor Pier. 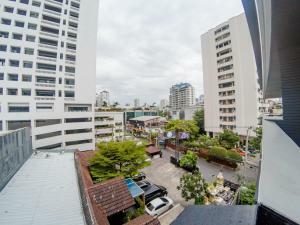 Spacious studio features a kitchen, a flat-screen cable TV and a DVD player. It comes with a washing machine, an iPod docking station and a safety deposit box. Shower facilities are included in a private bathroom. It has a private balcony with a view of the city. Rate: THB 3680.00 ... THB 15000.00; select dates below to get current rates. Featuring a balcony with a view, this suite offers a spacious living area, a dining area and a fully-equipped kitchen. An en suite bathroom features a bathtub or shower. Free toiletries and a hairdryer are offered. Rate: THB 5280.00 ... THB 10747.10; select dates below to get current rates. Featuring a balcony, this room features a comfortable living area, a dining area and a fully-equipped kitchen. A washing and a dryer machine are offered. An en suite bathroom features a bathtub or a shower. A hairdryer and free toiletries are provided. Suite features a spacious living area with full home entertainment system. It has a fully equipped kitchen with kitchenware and a dish washer. Includes a washing machine and dryer, ironing facilities and storage area. This studio has a balcony, toaster and sofa. Rate: THB 4080.00 ... THB 15000.00; select dates below to get current rates. This family room has a balcony, microwave and dining area. Located on a higher floor with a balcony, this room features a comfortable living area, a dining area and a fully-equipped kitchen. A washing and a dryer machine are offered. An en suite bathroom features a bathtub or a shower. A hairdryer and free toiletries are provided.